This morning, Ambassador Erfani participated in a Power Breakfast session on Women and Guns where he shared Afghanistan’s experiences, achievements, challenges and future prospects on this important matter. He also participated in the expert group meeting on violence against women and comprehensive security. The discussion focused on the understanding of the gender perspective of personal security in the OSCE participating states and partners for cooperation. The panel consisted of experts from various fields and organizations, including, representatives from the OSCE Gender section and the OSCE academy in Bishkek, the country representative of UN Women in Albania, the EU FRA and civil society. Ambassador Erfani expressed his gratitude to the partners of Afghanistan for their help during the stabilization process in the country for the last 13 years, with the empowerment of women being one important aspect. He referred to the need for a comprehensive approach that takes into account the physical security of women and girls, the prime victims of decade-long conflict, as well as women’s rights, poverty eradication, the creation of job opportunities and access to education and health. He emphasized that Afghanistan is committed to this important issue as one of the main national priorities and needs the international communities’ continuous and effective support. Ambassador Erfani emphasized that Afghanistan is continuing its efforts in improving the situation of women in the country. He stressed the commitment to implement comprehensive new security mechanisms to ensure that their rights are upheld in Afghanistan. Ms Naderi, MP, Ambassador Erfani and Ms Seraj at the panel discussion. Today, the Permanent Mission of Afghanistan hosted a colloquium on “Perspectives on Afghan Women: 2014 and beyond”. 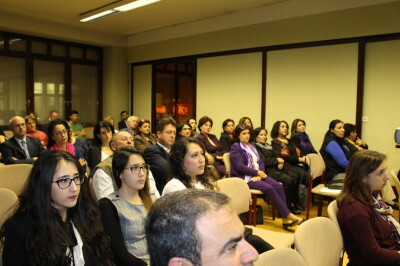 The event was made possible with the support of the UNODC and ACUNS, and took place at the Vienna International Center. H.E. Ambassador Ayoob Erfani opened the colloquium with a statement which started by thanking the international community for the support it has given to Afghanistan. He also highlighted the growing participation of women in all levels of government and civil society, which was embodied in the two guest panelists, Ms. Farkhunda Naderi, a current member of the Afghan National Assembly, and Ms. Mahbouba Seraj, Executive Board Member and Chair of the Afghan Women’s Network. After a second short welcoming statement by UNODC Director Jean-Luc Lemahieu, Ms. Naderi took the floor, giving a passionate statement which highlighted the progress that Afghanistan has made over the past 13 years, but also its many remaining challenges regarding women’s rights. She praised the Afghan people on its determination and courage in nourishing democracy, as seen by impressive voter turnout rates, especially for women, in its recent presidential election. Ms. Naderi was followed by Ms. Seraj and gave an equally fervent address entreating the international community to maintain its support for Afghanistan, as democracy in the country “has just taken its first steps and must be allowed to grow”. She also stressed the importance of engaging the youth, calling them the brightest hope for the country’s future. A Q&A session followed, where questions touched on a breadth of topics such as the emerging role of women in the area of security and the sovereignty of Afghanistan and its relationship with the International Community. Ambassador Erfani closed the colloquium by thanking all those who helped organize the event, as well as all participants, stating that this dialogue provided “renewed energy” to continue the conversation about women in Afghanistan and the decade of transformation. He emphasized the role that men also have in improving women’s rights in Afghanistan and reiterated the commitment of the Afghan government to improving the role of women in Afghan society. He concluded by signifying how vital the continued support of the International Community is during this period and the gratitude for their support thus far. Ambassador Erfani opens the colloquium on Afghan women. It is my pleasure to welcome you all to this Colloquium on “Perspectives of Afghan Women: 2014 and Beyond”. I would first of all like to thank the VIC and in particular, the UNODC as well as ACUNS for helping our mission to make this event possible. I appreciate your interest in Afghanistan and in particular your interest in the situation of women in Afghanistan. The issue of women’s rights and gender mainstreaming is gravely important and one that is close to our heart. Despite Afghanistan’s recent history of decades-long conflict where the women of Afghanistan became the prime victim and regardless of and remaining challenges among them the on-going violence against women, we are in the process of transitioning from three decades of war and transforming into a stable and democratic society. The post-Taliban Afghanistan, thanks to the commitment of its people and the continued support by our partners in the International community, has made excellent achievements, including on the empowerment of women. The Government of Afghanistan has taken specific steps at the national, regional and international level to meet its obligations to improve the situation of women. We have the most progressive Constitution in the history of Afghanistan, which provides equal rights and duties before the law for both men and women. Today, Afghan women participate in all levels of society; as members of the executive, judiciary and legislative branches in the Government, as civil society and NGO activists, and as a whole they are actively taking part in the on-going Transition process of Afghanistan to the Transformation Decade. As in the past, when I have discussed women’s empowerment I have always emphasised that without the active participation of women, who constitute over 50% of the Afghan population, we will be unable to realise our visions for a democratic, stable and peaceful Afghanistan. It is therefore my privilege to introduce today our two distinguished panelists Ms. Farkhunda Zahra Naderi and Ms. Mahbouba Seraj. Ms Seraj was born in Kabul, Afghanistan, and graduated from Malalai High School for girls and Kabul University. After 26 years in exile, she returned to Afghanistan at the end of 2003, and has since been working with the women and children of Afghanistan. She is the creator of a radio program for women called “Our Beloved Afghanistan by Mahbouba Seraj” which has been broadcast all over Afghanistan. She is a member of the Afghan Women Coalition Against Corruption and is also Executive Board Member and Chair of the Afghan Women Network or AWN, the biggest women network in Afghanistan. Ms. Seraj has been a tireless advocate for women’s rights, pushing for women’s participation in the Peace Jirga, as well as in the High Peace Council. She and other women’s rights advocates were responsible in raising women participation at the 2011 Bonn Conference and 2012 Tokyo Conference on Afghanistan. Ms. Naderi commenced her primary and secondary education in Kabul and Baghlan provinces, and completed her baccalaureate in 2001 in Harrow female High School in the United Kingdom. In 2004, she joined the Law Faculty at the Westminster International University in Tashkent and from 2004 to 2005 she was the representative to the faculty. Please join me in giving Ms Naderi and Ms Seraj a warm welcome. Let me join previous speakers in thanking His Excellency the Secretary General for his comprehensive presentation of the Annual Evaluation Report on the Implementation of the 2004 OSCE Action Plan for the Promotion of Gender Equality. As I have stated earlier today in my response to the statement by the UN High Commissioner for Human Rights, Ms. Navi Pillay, the empowerment of women and promotion of gender equality rank among Afghanistan’s greatest achievements over the past thirteen years of efforts and sacrifices, supported by our partners in the international community, with a view to providing a better future for the Afghan people. Last week, in this hall at the occasion of the Annual Security Review Conference, Ms. Shukria Barakzai, an MP from the Afghan Lower House (Wolesi Jirga) briefed participants about Afghanistan’s achievements including in the area of women’s rights. Next week, two more prominent women’s rights activists from Afghanistan, Ms. Farkhunda Zahra Naderi, another MP from the Afghan Wolesi Jirga, and Ms. Mahbouba Seraj, a civil society activist are scheduled to participate in the Gender Equality Review Conference, which marks yet another excellent opportunity to share experiences, lessons learned and challenges in the area of women’s rights in a post-conflict country like Afghanistan. Let me seize this opportunity to thank the Secretariat, in particular its Gender Section and H.E. Ambassador Miroslava Beham, the Chairmanship and all donors for their continued support to my delegation here in Vienna. The facilitation of participation of delegates, in particular women, to major OSCE conferences constitutes a key component of our excellent partnership with the OSCE. Afghanistan is strongly committed to the goals of OSCE’s Action Plan for the Promotion of Gender Equality, and we have taken concrete steps in this area on national, regional and international levels, complementary to OSCE’s efforts of the implementation of the Action Plan. We believe in the inalienable rights of Afghan women, who constitute more than 50% of our society, to fully participate in all spheres of society thereby contributing to our security, social life and economic recovery. Without our women’s full engagement we will not be able to realize our vision and ongoing efforts for a democratic, stable and prosperous Afghanistan. I would like to thank all Members of the Group for coming in such a great numbers to today’s G77+ China plenary discussion on ‘Living Well: Celebrating Unity for Prosperity’. I am pleased to be a member of today’s panel to prepare ourselves for the upcoming summit in Santa Cruz, at such a time when the international community is making efforts to negotiate the Post–2015 Development Agenda and to formulate a new global development framework.We are all equally committed to the long-standing ideals of the G77 + China, which has proved itself to be a powerful voice for the majority of today’s global population, and to expressing our collective position on the direction of the global development agenda. We are also realistic on the divergence of views in our group, of over one hundred and thirty States, on matters which are considered to be important to particular national or regional interests, and such divergence is not unexpected. However, we must work to ensure a possible common position, for the interests of every member of this group. We should emphasize the need for the United Nations’ more active participation in international economic and financial affairs, as well as its role in financing for development. The upcoming summit in Santa Cruz will provide us with an excellent opportunity for discussion and dialogue on some of the most pressing development issues of our time such as youth employment, women’s empowerment and inclusive and sustainable development, particularly towards the achievement of ISID. – What Living Well means for Women: A Development Path: Empowerment, Eradication of Poverty and Shared Prosperity”. Based on last year’s estimated reports there are about 73 million unemployed young people, which make up around 40% of the world’s unemployed. Youth unemployment, men and women, affects developed and developing countries alike. In such a time when the global impact of youth unemployment is rising, it is more urgent than ever for the G77 + China to play its role as global decision-maker to take effective and coordinated measures to establish youth employment and empowerment as national priorities. The Santa Cruz summit will be a timely opportunity for the G77 + China to address the integration of youth issues into global, regional and national development priorities, especially during this critical time when youth unemployment continued to rise in our countries. I’m truly delighted to be here to focus on the empowerment of young people, boys and girls – men and women, and ensuring their inclusive participation in the decision-making process and the implementation of the post-2015 Development Agenda. The critical role and courage of young people, their concerns, their energies, in the post-2015 development agenda process. Smart policies and investments, as well as the need to change some traditional habits to empower youth. To promote employment and income opportunities for young people, and to provide young people with the skills and competencies they require to be able to take advantage of these opportunities. To provide comprehensive yet occupation-orientated education as part of national education strategies. The advancement and protection of the rights of women. Mitigation of female poverty, through combating gender discrimination and full integration of women into the job market. Effective implementation of gender equality and the women’s rights agenda. Ensuring that gender equality, women’s rights and women’s empowerment are regulated by law. Providing Job opportunities for women. Address concerns of lack of access to education and health, and lacking an equal voice in decision-making. Putting an end to violence against women and girls in all its forms. Equal participation of women in decision-making in public and private institutions. Afghanistan is one of the founding members of the Group of 77. Since its foundation we have cooperated on promoting the exchange of economic interests and the strengthening of joint negotiation within the United Nations system. With regard to today’s discussions, Afghanistan has made great efforts regarding the empowerment of youth and the promotion of gender equality. These issues are of high importance for us and have been part of the priorities under our MDGs-based National Development Strategy and still remain as key components of some of our National Priority Programs (PPPs) particularly under the human resources development cluster. On this note, I would like to inform you about some of our national developments in these areas of discussion. Afghanistan has one of the world’s youngest and fastest growing populations. Around 70% of Afghanistan‘s population is below the age of 25. As we are entering the Transformation Decade, which will last from 2015 until 2024, it is critical for us to make strategic and well-coordinated investments in our young population, in order to help them realize their full potential. Concurrently, if we will not be able to provide employment to our youth, a big number of which are entering the labor markets every year, new social, and even security challenges will arise. Our experience in Afghanistan confirms that sustainable development will not be realized without the participation of youth as well as the equal and active involvement of women, at all levels, and in all spheres of society. In this regard, the Government of the Islamic Republic of Afghanistan has adopted several laws, regulations and policies in the framework of the new Constitution of Afghanistan with a view to expand the access of Afghan Youth and women to health services, education, and employment opportunities in the country. However, decades of civil unrest have left their mark. Through the conflict, many women have become widows and need to nourish and financially support their families without male support. Many children were denied access to education and other services, due to devastating security conditions, dreadful violations of human rights and un-democratic policies by the brutal Taliban regime. I am positive, however, about the future of Afghanistan. Nearly two-thirds of the population under the age of 25 voted in the first round of the presidential elections in April. This shows the enthusiasm and optimism that our youth have in the country’s future. By doing so, they expressed their desire to be heard and involved in political decisions and social developments. This is also the case for the women. According to the Independent Election Commission of Afghanistan, out of 7 million people who voted in the 5 April elections, 34% of them were women. Furthermore, we have been able to decrease the maternal mortality rate, as well as to improve the presence of girls in school. Our schools provide education to millions of children and hundreds of thousands in universities. We can surely say that the youth and women are not merely the beneficiaries of development but also the agents of Afghanistan’s transformation towards a self-reliant, stable and democratic Afghanistan. However, intensified efforts are still needed to materialize the full potential of Afghan Youth and women. Women are still the primary victims of poverty, illiteracy, malnutrition and health constraints. The literacy rate is only 14% for women and Afghanistan’s overall poverty rate has 35% of Afghans living below the poverty line. I would like to express my sincere appreciation for the support we have received from the international community to reach the positive developments I have spoken of today. Without the support of the International Community, Afghanistan would have been unable to achieve such drastic and positive changes. Nevertheless, a lot more still needs to be done. On behalf of the Government of Afghanistan, I would like to reiterate our strong commitment to joining efforts in addressing all remaining challenges regarding youth employment and the empowerment of women. Panel discussions, as the one taking place today are essential to raise our voices and to show commitment in tackling security, stability and development, especially those who suffer the most from poverty, conflict and war, our women and children. Ambassador Ayoob M. Erfani participated today in a panel discussion at part of the Vienna chapter of the Group of 77’s brainstorming session for the upcoming Santa Cruz summit this June. Ambassador Erfani sat at the panel with Ambassadors from Zimbabwe, Costa Rica, India and Chair of the group, Sri Lanka, to discuss and give introductory remarks on the two primary topics of discussion at the panel: Youth employment and women’s empowerment. The Santa Cruz summit will take place between the 14-15 June 2014 and will organize discussions with high level participants including 30 heads of states under the subject heading “Living Well – towards a prosperous new world order”. HE Ambassador Ayoob Erfani gave a statement during the meeting of the Asian Contact Group at the OSCE, in which Ambassador Erfani briefed participating states on the outcome of the first round of the April 5th election in Afghanistan and to discuss gender issues in the ACGM. He noted that due to the results with Dr. Abdullah Abdullah and Dr. Ashraf Ghani Ahmadzi as the sole contenders, a runoff election is to be held in order to determine the new President on June 14. Ambassador Erfani stated that despite premeditated challenges by anti-governmental elements within the country, over 7 million men and women, approximately 36% of whom were women, came to the polls and cast their votes, which showed a direct representation of the will of the Afghan people to achieve full-fledged democracy, stability and security in their country. HE Ambassador Erfani, underlined the importance of a peaceful democratic transfer of Presidential power, which will take place in the coming weeks. He reiterated that the steps taken and the support given during the election process by the OSCE, ODIHR and the international community were key during Afghanistan’s decade of transformation in aiding the country in overcoming domestic challenges and for allowing the establishment of secure elections resulting in a more transparent and democratic Afghanistan. Ambassador Erfani announced that he will return to the OSCE to deliver a presentation of the final election results and to give another briefing on the overall election process in order to maintain and encourage a high level of transparency between Afghanistan and OSCE participating states. He contributed to the ACGM discussions on gender equality by reiterating the efforts of his government to enhance the protection of both women and children, who represent those most affected by conflict in the country. Additionally, the Afghan Government has made changes to its constitution which reflects the will of the Afghan Government to create a balance between men and women and to guarantee women basic human rights under the confines of international law. Ambassador Erfani noted that gender equality is at the center of Afghan political policies and will remain a priority in 2014 and beyond. Ambassador Erfani concluded at the ACGM with his gratitude to those present and in the international community for their continued support.